The same is absolutely true with our relationships. If we do not apply a language filter, we will do severe damage with our communication and ruin our relationships. Be it with yourself or others, the words we speak can be a fertilizer allowing what lies underneath to blossom or it can bury it. Our self-talk is the best place to start. The words we choose are programs to our sub-conscious mind, which cannot differentiate between negative and positive. Prove it to yourself: In the room where you are now, look around the entire room and notice everything, but the color red. Now what was the first thing you noticed? Almost everyone will see everything red in the room. Some may try to ignore the color red, because they remembered they were not supposed to notice the red. So, we have learned that the mind will respond to what we ask it, no matter if phrased in a negative or positive light. If we are choosing ‘to be embraced’ with more positive things in our life, we must take action in choosing only the positive words that will bring us closer to our dreams. I was reminded how powerful this can be when I had an AD on a dating site years ago. I had listed many positive attributes I wanted in a relationship. And, I did attract all those qualities with my wife, Caryl. However, I must remind you to be veryspecific in your asking. One of the characteristics I asked for was an accent. In my mind I was wishing for something soft and lyrical to my ear (Southern, Aussie, or British). What I got was a New York accent. I am grateful it is not a hard New York accent. What we say does have a great power over ourselves and the people in our lives. Choosing wisely what we say can only benefit everyone involved. 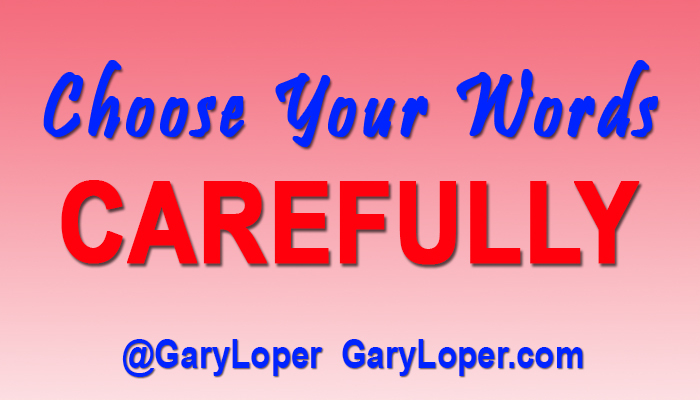 How do you choose your words? Would love to hear from you, simply reply to this blog. Diffusing Defensiveness – Building Better Behaviors!